Looks actually very close to the detailing of the current car's front end, so far i don't mind the details, but let#s wait for the rest. I pity any pedestrian that gets hit by a Lexus. The Grill looks like one of those metal shredding machines. But then again it's to 99,9% certainty plastic, so Mr. pedestrian should be fine - by getting hit by shredder standards. Presumably they still need to meet pedestrian impact standards. I think the "pointiness" of the front end is more a styling trick than from the front end being, well, pointy. 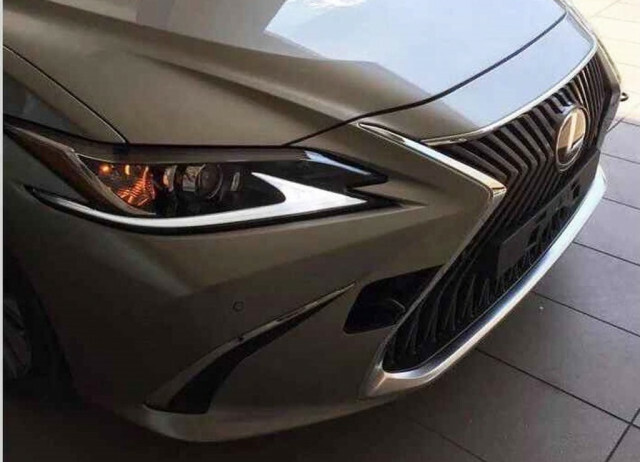 Considering how the ES's new Toyota Camry cousin has moved ahead with it's new-generation, as well as the new-generation Avalon, which I've seen at the 2018 New York Auto Show, and came away very impressed, and also taking into account Lexus's latest and aggressive designs, this new ES should be something to look forward to! Is AWD too much of a problem for this model? Its downright embarrassing that its not an option on toyota's supposedly excellent TNGA architecture as applied to the Camlon 350. You can have AWD on the C-HR in Europe (and no, not hybrid AWD with an extra electric engine, but your regular Haldex/viscous coupling hang on FWD/AWD system coupled to the 1.2t; So the platform is definitely AWD compatible. The new RAV-4 is also available with both Hybrid and regular AWD, and is TNGA derived. So not offering the Camry might be a strategic decision - likely driven by lack of interest by typical Camry customers - but definitely not a technical impossibility. For the lion's share of people, AWD simply isn't necessary. Granted, buyers have been swindled into believing they need AWD. My guess is that Lexus sells enough with the ES that an AWD version doesn't represent a significant sales bump. for pedestrian impact, they have pop-up hood... this is how they can lower the front end so much.